Harvard Square is full of students once again, and a major hub for the university and neighborhood is once again ready for them. The renovated Harvard Smith Campus Center reopens today, along with the first wave of public-facing dining options. Blackbird Doughnuts, Pavement Coffeehouse, Bon Me, and Swissbäkers are now in business. Pavement opened at 7 a.m. and will be going strong until midnight, says the coffee roasting company’s director of operations Andrew LoPilato. Located in the lobby of the main floor entrance, Pavement will be fueling folks using the campus center at all hours of the day. Any seating available is part of the campus center’s common areas, including an outdoor patio. The coffee bar dishes out mainly Brighton-roasted espresso drinks and and bagels, but a Harvard Square special debuts later this week: Pavement coffee soft serve, available in cups, cones, or as an affogato. Beginning Wednesday, Bon Me will serve breakfast at Harvard daily until 10:30 a.m., with dishes like a signature egg Bon Me sandwich, a warm congee bowl, and overnight oats. Blackbird Doughnuts can sate your breakfast craving now. The third location of the Gallows Group pastry shop, the Smith Center outpost opened this morning. Blackbird makes a selection of signature doughnuts like an old fashioned vanilla glazed, seasonal peach jam-filled brioche, and toasted marshmallow-topped s’mores. It also has a soft serve machine at Harvard, and will have a seasonally rotating flavor of slushie, starting this weekend with frozen apple cider. Swissbäkers has also unveiled its fourth brick-and-mortar. The Allston-based family bakery has a lineup of filled croissants, both sweet and savory; sandwiches, hand-twisted pretzels, cookies, and more. The company, which also has locations in the Boston Public Market and in Reading, has also started construction on a fifth location at North Station. Today also marks the first day for 800 new, public seats, both inside and outside, so you can still channel your inner Will Hunting. While it’s fairly unrecognizable from the Au Bon Pain days, the new space has a redux of the property’s classic chess tables. 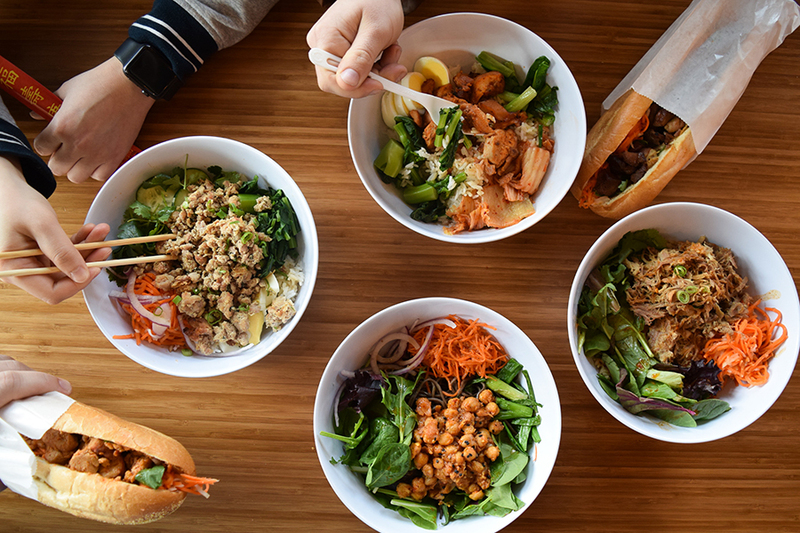 Still to come at the renovated Harvard University building: the third fast-casual Greek sandwich shop, Saloniki, by chef Jody Adams and her business partners; and a third location of chef Rebecca Arnold’s stellar salad shop, Whole Heart Provisions. Oggi Gourmet is open at a temporary location at 30 Dunster St., with plans to move into the renovated center. Formerly known as the Holyoke Center, the Smith Center has been under construction since 2016. Stay tuned for more updates on the new businesses opening this fall in Harvard Square. 1350 Massachusetts Ave., Harvard Square, Cambridge.